With the 2016 presidential race marching on, much of the limelight on the progressive left has been occupied by Sen. Bernie Sanders — but the presidential candidate is far from the only person working to curb the influence of money in politics. Zephyr Teachout, law professor, activist and Sanders-endorsed Democratic nominee for Congress, will bring her message to Chautauqua at 10:45 a.m. Thursday in the Amphitheater. 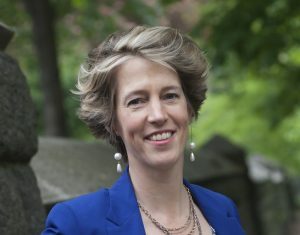 Teachout, assistant professor of law at Fordham University, began her political career working behind the scenes on Howard Dean’s 2004 presidential campaign as the director of internet organizing. According to The Huffington Post, she helped to pioneer many of the practices that are now standard for presidential campaigns, including the use of computer programmers, social networks for supporters and online fundraising operations built in courting small sums from huge numbers of donors. In the years that followed, she simultaneously influenced American discourse on money in politics as a self-proclaimed populist and studied the issue as an academic expert. In the former role, she launched a group called the Antitrust League in 2009 with the mission of breaking up big corporations; in the latter, she wrote the book on money’s corrupting influence in politics, Corruption in America: From Benjamin Franklin’s Snuff Box to Citizens United. In 2014, the same year she published Corruption, Teachout also gained notoriety for her first campaign as candidate, running against New York Governor Andrew Cuomo. She ultimately lost the Democratic primary, but not before she garnered 33.5 percent of the vote and made a name for herself nationwide as an activist to be reckoned with. As it turns out, the second time might just be the charm: a few weeks ago, she successfully won the Democratic primary to represent New York’s 19th district in the House of Representatives. According to Sherra Babcock, vice president and Emily and Richard Smucker Chair for Education, Teachout brings to the table a number of qualities she sought to have represented during the Week Two lectures. Perhaps most notably, she’s currently in the midst of a campaign for Congress, a rarity for Chautauqua. Babcock said Institution rules forbid candidates for political office from controlling their lecture’s audience or slate of questions, as well as from fundraising in conjunction with the Institution, so they typically do not accept when invited to speak. Although Teachout accepted her invitation before she declared her candidacy, she remained committed to speaking. But it’s Teachout’s position as an outspoken progressive that also makes her ideal to serve as one of this week’s five speakers. Babcock also said she knows Teachout’s politics are not necessarily for everybody, but emphasized the importance of representing differing opinions on money and power throughout the week. “[On Monday], President Tom Becker said, ‘If you agree with everybody who’s on the platform this week, you’d probably have a really difficult time making up your mind,’ because this week we knew we wanted to have different points of view,” she said. Teachout’s lecture comes at an opportune time; despite the fact that she has yet to ever be elected, she is seen by many as a quickly rising political star. After Sanders lost the New York primary election in April, Mother Jones cited her as a standard-bearer in the state for his movement to continue. Citing her performance in 2014, The New York Times recently called her “an unexpected political sensation.” Babcock voiced a similar opinion.